Whether your toddler is unadventurous with food or has a medical condition that prevents him from eating well, getting children to eat a balanced diet isn't always simple. Giving your 1-year-old vitamins can help ensure that your toddler gets all of the nutrients he needs to grow properly. Consult your child's pediatrician to make sure that vitamins are age-appropriate and safe for your child. Toddlers who are picky eaters can benefit from a multivitamin supplement. 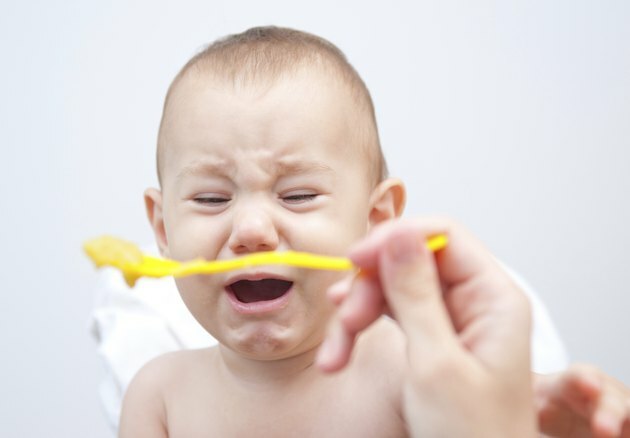 According to dietitian Debby Demory-Luce on BabyCenter, as long as your 1-year-old only takes the recommended dosage it is not likely he will overdose on one particular vitamin -- even if he is getting that vitamin from other foods. Daily vitamins are also beneficial if your toddler has a restricted diet. For instance, a child who is a vegetarian or is lactose intolerant may require a vitamin to help meet his daily needs. For optimal results, give your 1-year-old 1 milliliter of multivitamins once every day. Give a liquid supplement, as capsules or pills present a choking hazard. Choose a multivitamin that is designed for children, which provides the correct amount of nutrients for your toddler's age and size. Only give your child one dosage of vitamins every day. Although more vitamins might seem beneficial, overdosing is dangerous and can prevent the vitamins from absorbing properly, which can result in a nutritional imbalance. Don't rely just on vitamins as they do not typically contain 100 percent of every mineral and vitamin that your 1-year-old needs to grow properly. For example, if your child doesn't eat enough dairy every day and only gets about 20 percent of his calcium needs from his multivitamin, you'll need to provide other calcium-rich foods such as dark leafy greens. Make sure that your toddler eats a well-rounded diet full of vegetables, fruits, lean proteins, whole grains and low-fat dairy products. Only give your 1-year-old vitamins in liquid form -- vitamins that you must chew or swallow pose a choking hazard for young children. Always keep vitamins closed tightly and out of your child's reach. Children's vitamins are often flavored to make them more tolerable for children, which can make them seem like candy. However, a vitamin overdose can be dangerous and sometimes even fatal. Immediately see a pediatrician if your child experiences difficulty breathing, facial swelling or persistent diarrhea, which can be signs of a severe allergic reaction to vitamins. What to Expect: Does Your Toddler Need a Multivitamin?